KATIE Brennan may have set the world on fire with her three-goal comeback AFLW match. But it was another emerging star who set tongues wagging with her movement, marking and game sense. 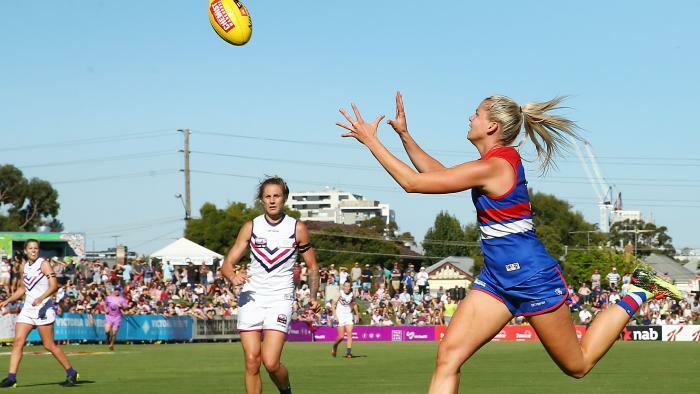 In her first competitive match since rupturing her ACL in 2016, Isabel Huntington returned with a bang, acting in tandem with Brennan as the deep and leading forward. Blink and you would have thought you were seeing double. The pair are only separated by 1cm, with the 18-year-old Huntington the taller of the two. Both can run all day and are natural born leaders. Together, they shape as the most dynamic duo in the competition. A one-two punch, if you like. “Issy Huntington is an absolute superstar and is going to continue to grow,” Brennan told foxfooty.com.au. “She brings so much — not only to our forward line, we can throw her anywhere — but she plays tall, plays small and can certainly find the goals. While Huntington didn’t impact the scoreboard, Brennan suggested it would only be a matter of time before the young pup took a match by the scruff of its neck. As a junior Huntington kicked four goals in one quarter for Vic Metro. “I was lucky to get on the end of a couple this week and I know that she will be able to hit the scoreboard as well,” Brennan said. Brennan, who recently took part in NAB’s ‘History in the Making’ campaign, played the opening two matches of the 2017 season before injury struck and ruled her out for the last six matches. The club’s skipper watched on as her team lost five consecutive games, their season over at the midway mark of the fixture. But a VFLW best and fairest confirmed Brennan would return to the second season of the AFLW better than ever. Saturday’s performance, where she earned eight coaches’ votes, was a testament to that. “For me it was massive,” Brennan said. “I guess you wait for 12 months for the opportunity to come around again and it was a pretty tough time last year, physically and emotionally, not being a part of it all in the first year. “But at the same time it taught me so much. I know that I’m a different person because of it and definitely a different footballer because of it.